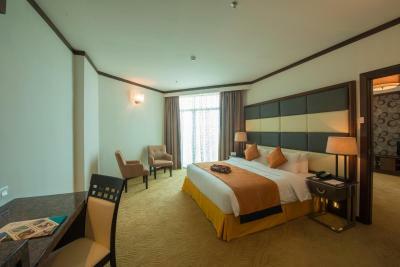 Lock in a great price for Adya Hotel Langkawi – rated 8.3 by recent guests! Nice hotel. Right in town and the staff were excellent from reservation, front desk, concierge, restaurants and housekeeping. Well done. The staff were really friendly and always ready to assist. The breakfast was decent. The breakfast was ok but could be improve & with a lot more variety. The location is great & ample parking space. 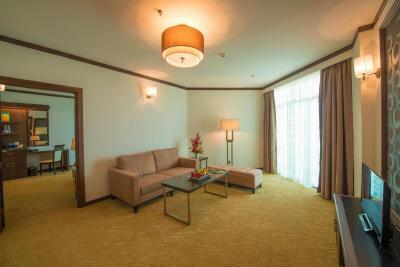 The connecting room was simply great as it provide convenience for our family. Yes We did make complain during our B/F,the Milk with insects in it. The staff respond by removed the insects only & replace the same Milk.....! I did argue again, told the Asst. Chef to removed completely & Yes he did replace new milk. The manager did respond & Apologize the incident. Staff working at Adya hotel is to help guest which is their first priority. Any thing you ask the staff they are ready to help you. All facilities available inside the hotel and also nearby. 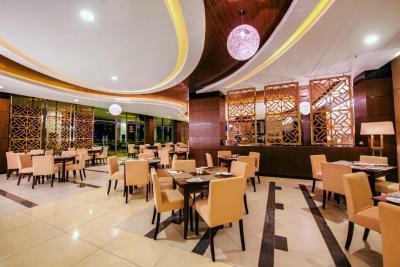 Good restaurant inside hotel with reasonable price. 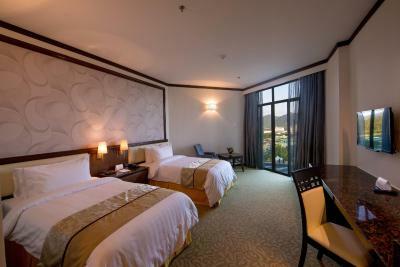 I loved the staff and the hospitality , Cleaness of the room. Good breakfast, they cater for all type of people. However, I would say you will also want to try the local Malay dishes around the Kuah town. its awesome. 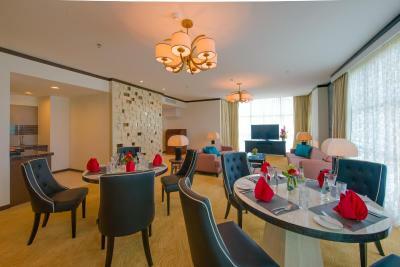 Everything from all the staffs i met, the clean /spacious room to the coffee hse buffet breakfast. Good job Adya! Will definitely coming back. TQ. The staff were amazing and very professional, the swimming pool. 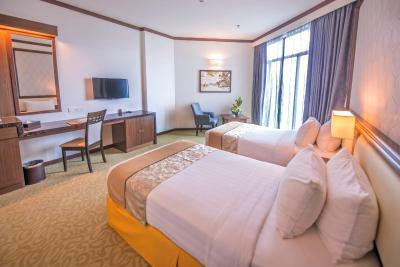 Adya Hotel Langkawi This rating is a reflection of how the property compares to the industry standard when it comes to price, facilities and services available. It's based on a self-evaluation by the property. Use this rating to help choose your stay! One of our top picks in Kuah.Inspired by Moroccan architecture, Adya Hotel Langkawi is strategically located in Kuah Town. Boasting Muslim-friendly facilities, this contemporary hotel has a female-only swimming pool alongside a family pool. There is a halal restaurant on-site and free WiFi is available throughout the property. 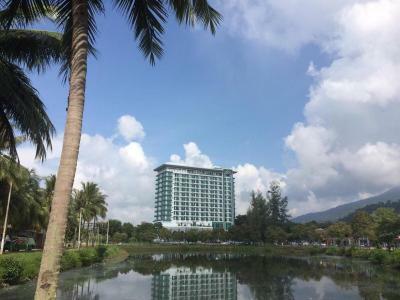 It is 1,500 feet to Langkawi Parade Shopping Complex, while Kuah Night Market is 1.1 mi away. 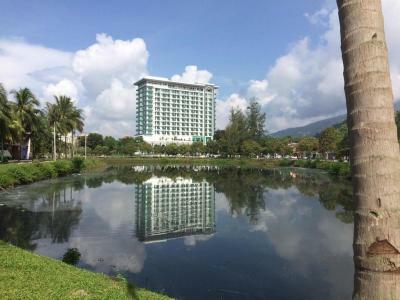 Eagle Square and Kuah Jetty are within 2.2 mi from Adya Hotel Langkawi. Langkawi International Airport is 9.3 mi away. 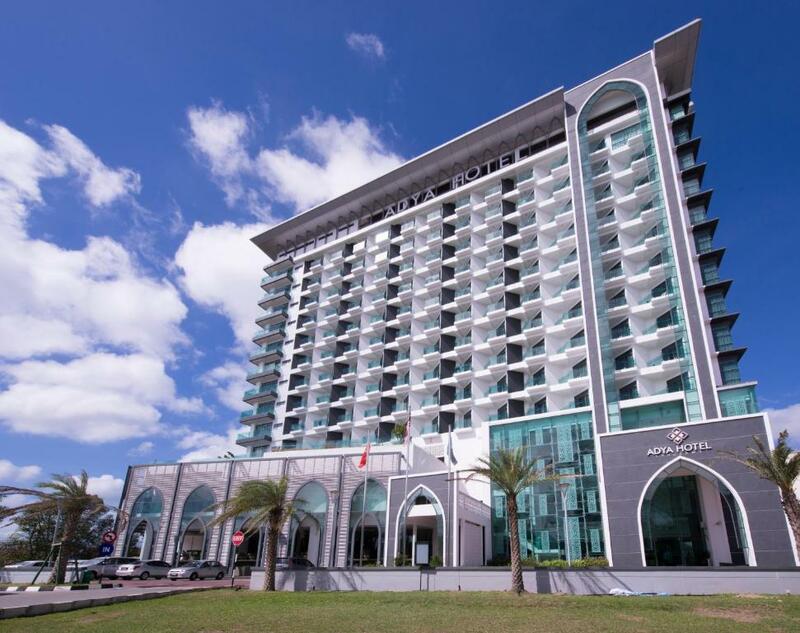 The property offers complimentary shuttle services to Masjid Aishah, 1.6 mi away. 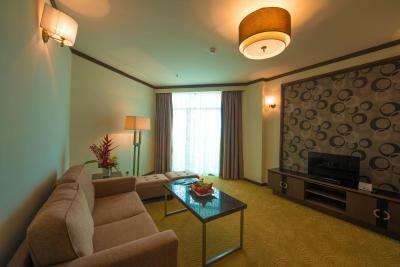 Elegantly furnished, every room is air-conditioned and fitted with large windows. A flat-screen TV and a prayer mat are also included. Certain rooms have city or sea view. The private bathroom comes with a shower and a hairdryer. You can have a pampering massage at the spa or workout in the gym. Friendly staff at the reception are happy to assist you with tour arrangements and other inquiries. 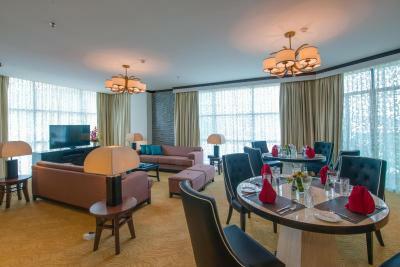 Guests can enjoy local Malaysian delicacies and popular Western dishes at Jelapang Restaurant. Meals can be served in the room upon request. This property is also rated for the best value in Kuah! Guests are getting more for their money when compared to other properties in this city. 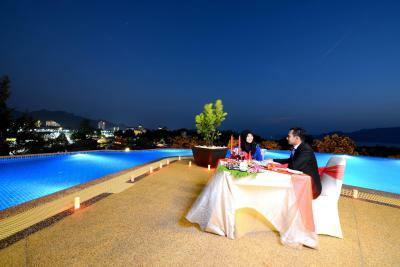 When would you like to stay at Adya Hotel Langkawi? 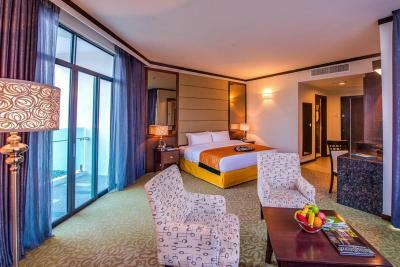 Featuring large windows overlooking the sea, this air-conditioned room is decorated in natural colors. It comes with a flat-screen TV and ironing facilities. A prayer mat is also included. The private bathroom has a hairdryer. 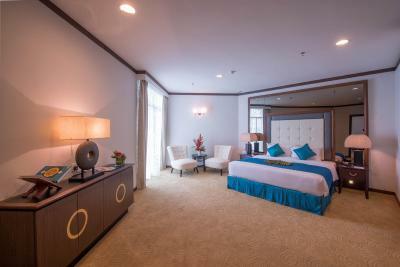 Offering more space, this spacious suite is fitted with a private balcony overlooking the sea. 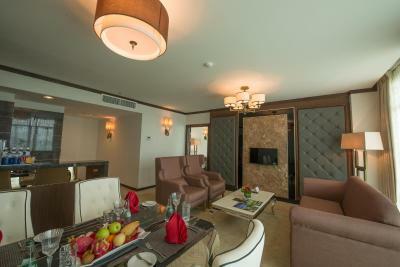 The large seating area includes a flat-screen TV and a sofa. 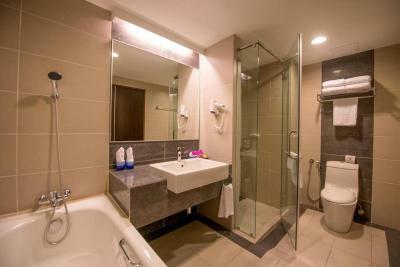 A prayer mat and ironing facilities are also available, The private bathroom comes with separate bath and shower. 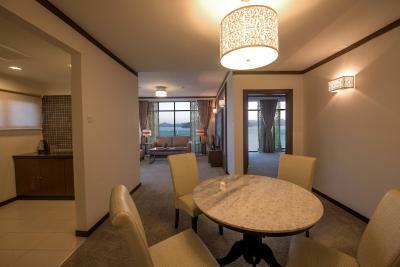 This 35 sqm air-conditioned room features large windows and neutral colors. It is equipped with a queen bed or 2 single beds. A flat-screen TV and a prayer mat are available. The private bathroom includes a shower. 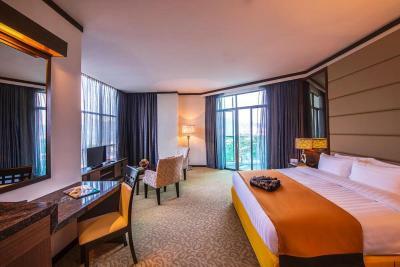 This larger room feature panoramic city view and elegant furnishings. Coffee/tea making facilities and a flat-screen TV are included. The private bathroom has free toiletries. Welcome a unique Islamic concept Hotels. 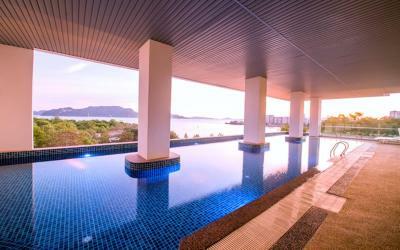 Adya Hotel Langkawi is perfect for travellers who simply seek to relax amid traditional hospitality and impeccable service. 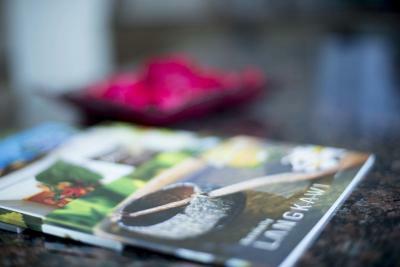 House Rules Adya Hotel Langkawi takes special requests – add in the next step! All children under 12 years are charged MYR 100 per night for extra beds. 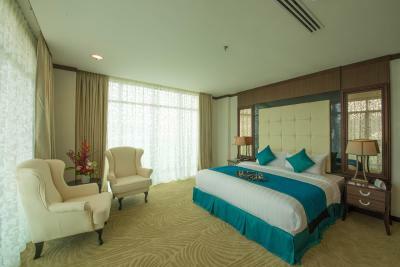 Any additional older children or adults are charged MYR 100 per night for extra beds. Adya Hotel Langkawi accepts these cards and reserves the right to temporarily hold an amount prior to arrival. 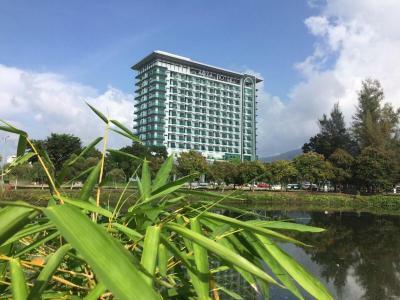 Beginning 1 July 2016, as directed by the Langkawi Municipal Council, a local government Tourism Promotion Fee would be applicable per room per night. I think swimming pool need more improvement. I like food for breakfast. Very nice and confident halal. location and staff very kindly and helpful . the breakfast is extremely good....and the view is very nice..
Gym not well equipped Elevators too small. The free breakfast has very large choice and in comparison to other hotels, much better quality, esp piping hot croissant. Ample parking spaces and proximity to Kuah town. Varieties of foods for breakfast👍🏽 Nice & very helpful staff. Toilet flush not function well and air-cond for master bedroom not cold. Dustbin is too small. Should provide bigger. Meal is ok but do not like due to the table arrangement. We cannot choose our own place. Excellent breakfast, loved the croissants and the omelette. Room was spacious and comfy, and the hotel was pretty close to the jetty. (5 mins drive or so).